If you've recently looked at your utility bills, you may have noticed that your home has used a lot of electricity lately. Fortunately, solar panels provide you with a cost-efficient way to power your home or officeand the team at AdtechEco can provide you with the solar panels and associated services you need to take advantage of this beneficial energy source. We proudly serve property owners in Newcastle and the surrounding areas, so don't hesitate to get in touch with us if you think solar panels are a good option for your home. We can also provide energy monitoring and management services so you don't have to worry about overseeing these parts of your building's energy system. 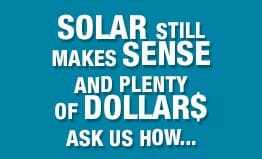 Likewise, we can help you better understand how to effectively use solar power in your property. For example, we'll let you know exactly how solar power can heat the water in your home or office. Solar power is a cost-effective and beneficial way to provide energy to your property. We understand that your house, office or other type of property is unique from others in your neighbourhood and therefore requires specific services. We have more than a decade of experience working with commercial and residential properties, and we're happy to use our skill and knowledge as we install or maintain solar panels on your building. If you have any questions, read through our brochure. When you're ready, call us today on (02) 4962 2466 to schedule a service for your property in Newcastle. You can also fill out our online form with any enquiries.